Good evening. I am Alice Maggio, Director of Programs at the Schumacher Center for a New Economics. On behalf of the Schumacher Center, The Berry Center, and The Land Institute, I would like to welcome you to the 36th Annual E. F. Schumacher Lectures, a tradition that tonight’s speakers inaugurated in 1981. We are grateful to Wendell Berry and Wes Jackson for their generosity in returning to speak tonight. We understand it as an expression of their long-time respect for Bob Swann and Susan Witt, the Schumacher Center co-founders, and of the friendships that were formed in 1981. 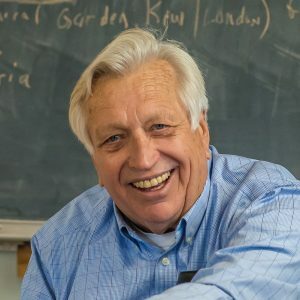 Bob left a legacy of effectively converting his theories of an economics based on peace, social justice, and environmental sustainability into practical programs. That work is reflected here in the Berkshires through the BerkShares local currency program and the Community Land Trust in the Southern Berkshires. I now have the privilege of working with those legacy programs and experiencing their vitality and effectiveness in addressing the pressing economic questions of today. As we grow our partnerships with groups throughout Berkshire County, I see the resonance these programs have with others and the way they reveal and respond to deep underlying problems in our economy. We at the Schumacher Center are fortunate to work here in the Berkshires, where citizens are not afraid to experiment in radical new ways—just so long as taking care of each other remains the purpose. Organizing this event has once again reminded me of the strength and generosity of our community. So many people have stepped up and gone beyond the ordinary to help put this event together—from catering the reception to putting together tonight’s production. Thank you for being part of it. I’d like to thank the following sponsors, who have helped to bring this event about: Blue Hill Farm, The Christopher Reynolds Foundation, Only In My Dreams Events, DOEN Foundation (Amsterdam), Good Work Institute, Fire Roasted Catering (which did our lamb roast tonight), The David Brower Center, Available Potential Enterprises (A.P.E. Gallery in Northampton, MA), The Berry Center, Main Street Resources, The Tabard Inn (Washington, D.C.), Morgan Bulkeley (whose artwork is featured on the back of our 5 BerkShare note), plantin’ seeds farm kitchen (Canaan, CT), Orion Magazine, Ron and Marion Stein, Robert and Roberta Silman. Also a big thank-you to the Mahaiwe Performing Arts Center and all of the staff here who have made it happen. When you have a sold-out program there are many last-minute details to be taken care of. We’re lucky to have such a beautiful place to hold events like this in our community. And of course we are grateful for our partnership with The Berry Center and The Land Institute, which have helped in making this event possible. We hope it is the first of other future undertakings together. Thanks to everybody else who has contributed to this evening’s production. We’re going to record the program so that you can view it online and share it with friends. You can find it on our website: www.centerforneweconomics.org. It is now my pleasure to introduce Mary Berry, Executive Director of The Berry Center and, I’m proud to say, a member of the board of the Schumacher Center for a New Economics. Mary Berry grew up as a member of the eighth generation of a farming family in Henry County, Kentucky, daughter of Wendell and Tanya Berry. 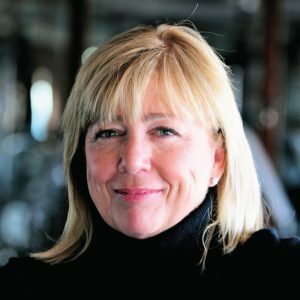 She has followed in the family tradition by having been a farmer, entrepreneur, and now the founder of The Berry Center, where she works as an advocate for family farmers around the country. I’d like to welcome to the stage Marry Berry, who is going to introduce our speakers for the evening. MARY BERRY: Alice Maggio mentioned that I’m a board member of the Schumacher Center for a New Economics, and I am very proud of that. I’m proud to be Susan Witt’s friend; I’m proud to work with her on her efforts to improve our situation, and I’m also very glad to know Alice and to have spent time with her family this evening. I want to thank Amelia, the Librarian of the Center, and Amelia’s wonderful grandmother Hildegarde, who is a fellow board member. Rachel has worked to pull all of this together. I think that’s all the people I need to thank. I’m to introduce Wes and my father. You’d think that wouldn’t be a difficult job for me, but it is a little difficult. You don’t know how much truth to tell, really. In my work at The Berry Center, I have been in need of teachers and of a vision for my work. I’ve been lucky in both regards: the vision I have for agriculture in the place that I’m from—and finally in places that we’re all from—was given to me, handed down to me, from seven generations of farmers before me. I first met Wes when I was in my late teens. His first question to me was something like, “What do you think of the Mesozoic Era?” I still don’t know much about it, and I think my answer was, “I don’t really care.” I considered that a rocky start, but we have gotten over it or I’ve gotten over it, and I’ve loved him now for close to forty years. I don’t believe I have given a speech or taken part in a meeting without having quoted him. The first thing I did after starting The Berry Center was introduce a four-year agricultural program based on his idea of the necessity for an education for homecoming. There’s a picture that I love of my grandfather John Berry, Sr., my father Wendell Berry, and my uncle John Berry, Jr. It’s at a place we call the home place in Henry County, where my uncle lives to this day, where my grandfather was born and his father was born. I look at that picture a lot because I love it, and I love the place, and I have thought often and said that if I could add one more man to that picture it would be Wes Jackson. My father has written stories of what he calls the membership, which I have taken my place in, and he has kept alive in my mind through some difficult times that what we are working for is possible, that we don’t win, but we don’t lose either; we just keep on. Now, I’d like to include in my introduction that neither my father nor my mother has ever disappointed me. Please welcome Wes Jackson and Wendell Berry. [In response to resounding applause:] I know, that was an excellent introduction. Thank you. The problem of sustainability is simple enough to state. It requires that the fertility cycle of birth, growth, maturity, death, and decay—what Albert Howard called “the Wheel of Life”—should turn continuously in place, so that the law of return is kept and nothing is wasted. For this to happen in the stewardship of humans, there must be a cultural cycle, in harmony with the fertility cycle, also continuously turning in place. The cultural cycle is an unending conversation between old people and young people, assuring the survival of local memory, which has, as long as it remains local, the greatest practical urgency and value. This is what is meant, and is all that is meant, by “sustainability.” The fertility cycle turns by the law of nature. The cultural cycle turns on affection. Okay, make something of that, Wes. WES JACKSON: Well, I put Mary up to this because I think that is one of the most inclusive and brilliant statements about the necessity for our time. It’s absolutely correct that we have to close the fertility cycle, and if we don’t have the cultural cycle taken care of, then the fertility cycle is going to simply be a part of the modern extractive economy. This forum tonight is supposed to be about the 50-Year Farm Bill, and what I’m hoping is that the 50-Year Farm Bill, as we rewrite it, will include not only the ecological necessity of an agriculture that is sustainable but will carry with it the necessity of the cultural transformation to go with it. You don’t create a satellite of agricultural sustainability and expect it to safely orbit the extractive economy. I want to report a little bit on what happened with the 50-Year Farm Bill. Wendell and Fred Kirschenmann— farmer/philosopher, Distinguished Fellow for the Leopold Center for Sustainable Agriculture, and President of Stone Barns Center for Food and Agriculture—and I took it to Washington, and it didn’t go anywhere. That was in 2009, and I think you have before you various graphs and figures, which you can look at later on your own, showing how we imagined the 50-Year Farm Bill would be carried out. What has happened since 2009? As many of you may know, we at The Land Institute have been working to develop perennial grains that would be grown in mixtures where we have a vegetative structure that is sufficiently similar to a natural ecosystem, like a prairie, and where we bring the processes of the wild to the farm in order to have an efficient way to bring about the fertility cycle. When I first published on this almost forty years ago, I said, “This is going to take 50 to 100 years,” and I can report tonight that we are ahead of schedule. The first perennial grain in the history of homo sapiens, which is also the first new grain crop in 4,200 years, is now being marketed through Patagonia, and there are 650,000 16-ounce cans of Kernza beer now available in Washington, Oregon, California, and soon in Colorado and Utah, plus we have several hundred acres now growing in places like northern Iowa and also southern Minnesota. And I understand that now there’s also some Kernza growing that is associated with the Farm Hub in nearby New York state. So some good things have been happening, and I think the largest, most important part of it is that three of our young scientists, all breeders, have discovered why our ancestors never developed perennial grains and why we can now; it has to do with the fact that annuals tend to self—that is, to accept their own pollen, which is the tightest form of inbreeding—so if you have a mutant that arises, it gets quickly eliminated. Perennials tend to outcross, and then what we call the genetic load, the mutational load, builds up. It’s why humans outcross: if you don’t outcross, you end up with something like the pharaohs and some of the problems among the royalties of Europe. Lee DeHaan, Stan Cox, and David Van Tassel, three of our people, published a couple of pieces in refereed journals, indicating that we now know how to purge that genetic load, partly because of our modern computational power and also because of our greater understanding of the molecular basis of genetics. That’s the big, good news, and as a consequence there is now an inventory underway involving Missouri Botanical Garden, St. Louis University, and us, The Land Institute, to do it. All the way from the tropics to the temperate zone, any plant that is herbaceous, perennial, hard seeded and is in the grass, legume, or sunflower family—there are a few others—now will be scrutinized. As part of that effort we currently are supporting fourteen post-docs and three graduate students who will be acting on the results of the inventory, and then there are various colleges and universities around the country that are involved as well. Part of the good news is that since 2009 both the United Nations Food and Agriculture Organization (FAO) and the Royal Society have endorsed the importance of perennials, and the FAO has been hosting conferences on the subject. We are now at work not only on what we call the Kernza but also on perennial wheat, a hybrid. For several years we’ve been supporting the perennialization of rice in China. Joan, my wife, and I were just there for a couple of weeks. Three years from now, there will be hundreds of acres of perennial rice. We’ve been supporting the upland rice, but the Chinese are extending this to the patty rice. Then there is the wheat and the sorghum in three different countries of Africa, and David Van Tassel is working on a member of the sunflower family, a plant that didn’t even know we were having a drought. We can up the ante a bit if we can take the 50-Year Farm Bill back. We have much more to say, including what Wendell’s been talking about for years. MARY BERRY: That’s because you came up with it. WES JACKSON: Yeah, well, I move along, Mary, you know. Anyway, that’s enough for now. MARY BERRY [turning to her father]: When we were talking this afternoon or yesterday or two months ago, you said that we want to talk about perennial populations of people on the land. 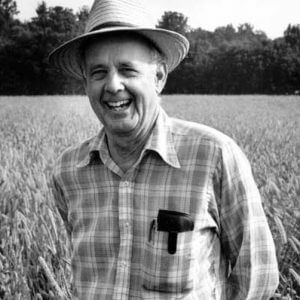 WENDELL BERRY: The importance, to my mind, much influenced by Wes, of the 50-Year Farm Bill is that it proposes to bring agriculture back into line with the laws of Nature. I think there are such things as laws of Nature. The proposed movement, over the next fifty years, is from an 80% investment of the land in annuals to an 80% investment of that land in perennials. Nature loves perennials. To her, annuals are Band-Aids. The perennials are her skin or her pelt. She gives us the law of gravity, which is a precious law because it brings all things down. All the fallen, all the dead, are brought down by gravity to the topsoil, where they’re converted into fertility. If you imagined a world in which all the organic matter flew out, that would hardly do. We owe a lot to gravity. But Nature’s second law is that once this fertility is made, it must be kept in place, and her use for the perennials partly is to hold it in place. So you’ve got the second law that is sort of right-angled to the first. There are various ways of obeying this law in agriculture: contour farming is one, but continual perennial cover is the ultimate answer to the wasting of fertility. Her third law, and I don’t think I’m just making this up, is that if we don’t obey the second law, she uses gravity to punish us, and we have to sit and watch the fertility flow away into the rivers. Now, Nature is a great dame, very admirable, but she’s very stern. She’s a courtly old lady, but she has no court of appeals. I’m talking about what it’s taken me years to learn to say. There’s no court of appeals, and what’s gone down the river is gone; there’s no bringing it back. And so we undertake this work in a kind of tragic position because all we have to work with is what we have left. I’ll leave it at that for the time being. I think this is a statement that is saying you cannot expect to solve these problems for this land animal that has now invented agriculture; you cannot expect to solve those problems simply through plant breeding, animal breeding, or whatever. It is going to require a world without fossil fuels for sure; it’s important to realize that agriculture is number two as a source of greenhouse gases, behind power plants and ahead of all transportation. That alone is reason to get on it, and either you have a sufficiency of capital with a lot of fossil carbon behind it or you have a sufficiency of people. It comes down to that, and it requires the development of cultural capacity that must be handed down. I’m just quoting what Wendell said back in The Unsettling of America. MARY BERRY: Well, we don’t have enough “eyes to acres” to watch over the land; fewer than 1% of us farm. Talk a little about what it will take. What do we need to be doing to have more farmers, and once we have them to have a culture that they can afford to farm well in? A culture that supports them, an economy under them. WENDELL BERRY: I think what we’ve got to learn to say, and we’ve got to say it, is that industrialism is failing. It’s failing very prominently and visibly. Industrial agriculture is failing, as anyone can see who knows anything about agriculture. It’s failing because it proposes and tolerates no limits. We started in the middle of the twentieth century with the doctrine that there were too many farmers, and that’s never been called off. Nobody said how many we needed to get rid of. There’s a whole story there. For example, in the Midwest at one time there was a mill every twelve miles, and that was for the convenience of the producers, who were thus never more than six miles from the mill, which meant that, driving a team of horses, they were never beyond the possibility of hauling a load of grain to the mill and getting home again for dinner or supper. That’s a very good limit, you see. And it employed a lot of millers and it employed a lot of farmers. If we were really serious about the importance of jobs, employment, and so on, we would have to take that seriously as an example from the past, now irrecoverable. If we had been Amish, we would have stopped it right there. We would have accepted the limit of the horse. That’s the limit that was involved, a limit imposed by an organism, the right kind of limit in our use of the natural world. So we accept no limits, and we do the most we can of everything we do, which is usually either explosive or toxic, and the fix that we’ve put farmers in is well described in a letter to Mary from our County Judge Executive at home. He does the accounting on his own farm operation. Like most farmers, he has an off-farm job in order to earn the privilege of being a farmer, which is why he’s the County Judge Executive. He’s smart, and he’s on our side. I have taken a couple of afternoons to work on the accounting for farming cattle under the current terms. Enclosed you will find that product based upon a real example, which is our 100 acre farm on the Straights Stretch—that is, of the Lacey Turner’s Road—and its approximately 25 cow herd. I learned several things from this exercise: the good news is that for a young man wishing to earn a middle to slightly below middle-class annual salary of $45,000, farming cattle full time, he only has to have $3,281,000 in capital to get started. If he can find 780 acres to rent, he only has to have $551,000 for used cows and equipment. I say this is the good news because the reality is that this was based on a weaned calf price of $850 from June of this year. According to today’s sales report that same calf is now $650 at best, and it’s gone down since then. That’s the fix we’ve put our people in. The cultural cycle that involves the carrying on of knowledge, memory, affection from one generation to another can’t start from where we are now. We’ve got to do better than that. We’ve got to make it worthwhile for people to do the work, and we’ve just assumed that we can hand this problem on to farmers and meanwhile hold them in contempt. MARY BERRY: I was just thinking about the farmer you heard at a meeting. He was talking about good farming, and as I remember, he said, “It’s very hard to make the right decisions when you’re wondering who the next person is who’s going to live in your house.” Where we live, that’s the situation farmers are in; they’re in a constant emergency. So when I travel and speak, speaking to largely urban audiences who want to know why farmers don’t just take up local production for local markets, I recognize a deep divide, the cultural divide between urban and rural places. You’ve talked about the reconnection that needs to take place between urban and rural places. The local food movement has been going on for something like forty years, and during that time the divide has gotten wider, not narrower. Maybe you would both like to speak to that. WES JACKSON: It’s one of the reasons we’re putting in what we call an ecosphere studies program at The Land Institute with the goal of essentially changing college and university curricula in such a way that the liberal arts are used to speak to modern problems. We’re still living with the assumptions of 1600 and this side of 1600; we’re living with the assumptions and products of 1750 and the beginning of the Industrial Revolution; and we’re also living with the assumptions that are possible as a result of what came out of the Drake Well, the first American oil well, drilled in 1859 in Western Pennsylvania. Bill Vitek, who’s at Clarkson University—Bill’s here tonight—and I are thinking about a curriculum. We’ve been working on this for some time now to figure out what a curriculum would look like that would educate people to go home rather than use their education for upward mobility if not lateral mobility, to go home, dig in, and be there long enough for affection to grow and for intelligent action on what is needed in that particular community to come about. You take with you some Virgil, you take with you knowledge of the bio-geo-chemical cycle, you take with you the idea of what it would be like if we put a cap on carbon, and then you figure out how good our technology can be. We pay attention to some of the philosophy of Alfred North Whitehead and others who have been thinking about limits. What does it mean to live with limits? It’s very hard to get any politician to deal with this kind of question, and so we’re going to have to begin to develop a constituency of folk who acknowledge limits. We don’t know exactly where we’re going with this, but what we do know is that there is work being turned out that is too shoddy to be either useful or artistic, and it really doesn’t come close to asking the question, How do we meet bonafide human needs in a no-growth economy? We’ve got to ask that question. Among the things we’re hoping to do—and Wendell’s the one who set me off on this a long time ago—is address an ignorance-based worldview rather than a knowledge-as-adequate worldview. What do you do if you acknowledge your ignorance? Wendell has said—somewhere sometime on a phone or in writing, I can’t keep track—that we’ve got to feature questions that require more than the available answers in order to drive knowledge out of its categories. You see, if you’re asking a question that has an answer, there’s a good chance that it’s a wrong question. We’ve got to get bolder with this, and that means a bolder curriculum, so we’ve been bringing professor types from universities to The Land a couple of summers in a row. We’re still kind of clumsy at it, but we have people who want to do this, and there are students who want it because they know the party’s over. A lot of students know the party’s over. Now we’re beginning to talk about a whole different agenda for our future. WENDELL BERRY: To put that in practical terms— down to the very ground underfoot is what I mean by practical—we have to recognize that the earth’s places are unimaginably diverse. The analogy I was thinking of would be to an audience of people. This is a large audience, fairly large for things like this; you can double it or triple it, and there still would be no chance that there would be two identical people in it. The same is true of the places of the earth. Even where it’s at, and clearly where it begins to become steep, the aspects—the fertility, the bedrock, the closeness to the bedrock, exposure, all those things—of each of those places are different. Any little field, if you put a plow into it, will reveal itself as a composite of several even smaller places, and to treat this as if it were all uniform and you could apply uniform or universal technologies to it is like applying a cookie cutter to a lot of dough; you don’t get the sensitivity and the artistry that are necessary to the good use of these lands. To talk this way is to imply a need for a long time and a lot of patience that our present love for sensations and crises doesn’t accept very easily. I wrote a good while ago an essay called “In Distrust of Movements.” I can’t remember everything I said in it, but I meant everything I said. I’m talking now from more distrust than before because movements end, whether they succeed or definitively fail, and they’re hard to revive. Then the next crisis comes along. And so our crises have the psychology of fads. Now every article you pick up is talking about climate change. Well, I’m old enough to remember civil defense. Everybody was worried about a nuclear attack. People were making bomb shelters in their back yards and storing food and collecting firearms so that they could kill their neighbors when the neighbors came over to steal the food, and so on. Tanya and I were assigned an escape route up Highway 1 in California, which would have been an escape route to a traffic jam in about two and a half miles. The nuclear threat has not gone away, but we don’t think much about it anymore. It was very pro table to some people for a while. In the situation we’re in, every cause becomes a distraction from every other cause. To deal with this long-term effort—this long-term work that we’re going to have to perform to bring our lives, which is to say our economy, into line with the nature of our country—is, I think, going to take work on a broad economic front. I’m not talking about distinguishing between socialism and capitalism or something like that. We’re going to have to begin to understand our economy as a way of taking proper care of the things we have, just as we think about the economy of a household. I remember Gary Snyder years ago telling an audience, “We’re just at the beginning of a twelve or fifteen hundred year effort to learn to live in our country,” and I heard that with relief. WENDELL BERRY: Thank you, thank you, Wes. Here’s some good news. It’s wonderful to stare out on a prairie—and I’m sure you people in forest country stare out on forest—and realize how all the bills get paid as the consequence of what is becoming, thankfully, a fashionable term: emergence. If you have three species in a mix, with one of them fixing nitrogen, and if those three species are not going to be torn up every year and the biota of the soil is able to work, then you are going to get a tight nutrient cycling; all it takes is putting in two or three species. You don’t have to put in all of the species that we would see on the prairie. What we know is that prairie runs on contemporary sunlight, with no introduction of alien chemicals, no fertilizer, so that you have an ecosystem—Chris Field at Stanford and Carnegie Institution for Science in Washington published on this in 2002 in Science. Nature’s ecosystems generally have greater net primary production than the human-managed systems that follow. That’s big. Why is that? Well, millions of years of evolution have contributed to those natural integrities, and in a social sense if we can stay put long enough to stay dug in, there will be similar emergent properties that will manifest themselves. You know what I mean by an emergent property? For those who didn’t nod your head the way I want it nodded, you take two gases, hydrogen and oxygen, you put them together, and you get wetness. Wetness is an emergent property. In fact, you can have emergence for the negative, and that, I think, is one reason societies keep getting blindsided. I also think it’s partly behind what Jay Forrester wrote about forty years ago at MIT concerning the counterintuitive behavior of social systems, and he’s thinking of social systems within the industrialized world. If you can as land animals come to a place, dig in, get to know the place, and if you’re there long enough, you begin to develop affection for the place and for the people in the place. Then when a developer wants to put in a housing development on agricultural land, people rise up and say, “No, we love this place as a place to be growing food, and do your in ll within your cities or your towns.” But this is going to require, I think, a different kind of education and not an education for upward mobility, which is what our current education system is about. It’s going to require an education that acknowledges the necessity of having that cap on carbon. Here’s what we’ve got to get clear: systems theory is another form of reductionism, and we keep trying to put things together, thinking it’s all going to work, but it doesn’t because there is the reality of emergence. WENDELL BERRY: Reduction is inevitable with humans. When they figure something out, it’s always reductive. The issue we’re talking about is allying ourselves with our land and its nature. In doing so, we begin to get the benefit of an intelligence that’s greater than ours. That risks speaking figuratively, but I don’t know how you would construe the survival of natural ecosystems except as the product of a kind of intelligence that’s incarnated in a place over a long time. And then we intrude with our simplifications, and we put it in danger. But we can invite back the nature of the place by means of locally adapted plants, crops, and in general by respecting the nature of the place and obeying Nature’s laws. WES JACKSON: Just to add to that, once you start the journey for simplification, there’s a tendency to become simplifying. There’s an allure there for further simplification, and of course there ain’t no bottom once you start that journey. MARY BERRY: I’d like to talk a little about Alice Maggio’s work—Alice, who introduced me and whom you all listened to—with BerkShares local currency here in this community. As a young woman born and raised here, who loves it here and goes to work here, she’s been quite an inspiring example for me. She didn’t have to build a foundation because she already had one. It seems to me that she’s a model we need to look at. At The Berry Center I follow at least three generations of people who decided to come home. As my father says, it was not because it was his duty or because he had to; he wanted to, he did what he wanted to do. Wes, you have said that to help farmers you’ve got to help their communities. You and I, Daddy, have talked about running out of options. My work at The Berry Center is really coming down to one farmer on one farm. What will work for this farmer in this place for this community? And for another farmer and another farmer? So I’d like you to talk about how we go to work. WES JACKSON: You go first, Wendell. I’ll say something later. WENDELL BERRY: Well, the great mistake is to separate the land and the people. We’ve done it over and over again, and it doesn’t work. The clearest example I know is Harry Caudill’s book Night Comes to the Cumberlands, published in 1963. A very important book to me because Harry Caudill also was a homecomer, and his example was one I needed in 1963 because I was about to come home myself. Harry talked about the exploitation of the coalfields of the Cumberland plateau. It’s a tragic story of exploitation of the land and the people. The land was exploited by exploiting the people and vice versa. Harry’s book gained a reputation among the liberals. I remember seeing that book reviewed in the first issue, I think it was, of The New York Review of Books, which I don’t think would review it now. The notice given to Harry’s book brought the war against poverty into Eastern Kentucky. The idea of the war on poverty was to cure the poverty of the people, not the impoverishment of the land, and of course there was a great bureaucratic endeavor, a great fad of helping the poor. The result, 53 years later, is that both the land and the people are worse off than they were then. A little organization started up there in the mountains at about the time of Harry’s books. It was called The Appalachian Group to Save the Land and the People. I’ve always remembered that name as an instruction: keep ‘em together. You can’t reduce the poverty of a people if you’re allowing their land to be destroyed under their very feet and they are being paid poorly for their work. So we have to keep both the land and the people in mind. The land here could produce Alice. She’s a local product of the landscape by way of her family, and this involves us in complexity of a kind that we’re going to have trouble dealing with. There are, I’m sure, a number of products of this landscape that are not Alice and nothing like her. That’s part of the issue too. MARY BERRY: We’ve been kind of evangelistic in our efforts. One of the things we haven’t learned to do, it seems to me, is to be willing to look at a place like Henry County, or like this place, and ask what’s here? What can we work with here, what’s working here? What’s happened here? WENDELL BERRY: What’s here that’s worth saving? MARY BERRY: What’s here that’s worth saving? That is part, I think, of our education for homecoming or ecospheric studies. WENDELL BERRY: Mary’s always after to me to say something good about The Berry Center. WENDELL BERRY: I was going to say something about it, that it’s good and it encourages me. The problem is to get it into some kind of a context. This advocacy started in a public way with my father. It took me thirty years to understand that my vocation was the same advocacy. It’s also taken Mary a long time to realize that this advocacy is her vocation, as it clearly is, and to take it up. What’s encouraging to me about it is not something that I can say easily as a compliment. What’s encouraging me about it is that I know these family histories, and I know the clutter and the mistakes and the indecision and the wrong directions and so on that have been the context of this continuity. That’s why it matters to me. Knowing the context, it’s hard for me to say how greatly the continuity matters to me. So there’s a complete statement. We want to talk about economics and economy. If we’re going to talk about The Berry Center, which continues your father’s work, maybe you should talk a little about the Burley program. WENDELL BERRY: Wait a minute. Wes needs a chance to talk. When he gave the floor to me, he said he would say something later. MARY BERRY: Oh, I’m sorry, Wes. WES JACKSON: That’s okay. I’m just a Methodist. Long suffering, you know. You Baptists go ahead and have your way. No Mary, we’ve got plenty of time to say more; we just won’t let these people ask any questions. What I wanted to say is that Joan and I went all the way from Vietnam to Inner Mongolia, where we visited a tribe called the Miao. The Miao people built right on a hillside, and if there is a space a third the size of this stage, they’ll have a rice patty right outside their door. The steep terrain of the Miao people limits their use of technology, and they are living within the limits of their territory, of their particular place. Chairman Mao, or somebody after Mao, decided he was going to get rid of all those rice paddies, start ripping them up, and put them somewhere else. The people protested, and they saved several of those kinds of places. We also traveled through a wide, long valley, where there is patty rice and some corn. And there is the machine. Wherever there is a landscape that will accommodate the mechanical harvesting of the rice in the mud, it will be done. We saw large industrial equipment in that wide, long valley. So where there are limits geographically, there’s an opportunity for the human qualities to come out that we’re all so much in favor of. Now, this isn’t an irritation; it’s just that so little attention is paid to flyover country where some 70% of our country’s calories are grown. I count the folks in the East and in California who are involved in sustainable agriculture featuring fruits and vegetables as the core of a necessary constituency to help the rest of the country. But I have to say that it’s nearly impossible to have anything like what you folks have here with your local, your organic, your community supported, your this, that, and the other. I just wish that every one of you—if you haven’t done it—would drive across Illinois, Indiana, Iowa, Nebraska, Kansas in April when they’re planting the corn or later planting the soybeans, and there you will see where the 70% of the calories are coming from on about 70% of your acreage. It’s fertilizer, it’s pesticides, it’s places like Des Moines that have to put in at least a $25 million facility to clear out the nitrogen in the water. It reminds me of those rice patties where the scale is right, but then in comes the fossil fuel. I don’t know about the culture of the folks in those places in China where the industrialization of agriculture has come, but I do know a little bit about the artistry in the village of the Miao people. It’s rich. They wanted to come back, and they are the ones who started the comeback and stopped whatever it was coming out of Beijing. There’s something about the temptation of scale. If there is plenty of fossil fuel, then it’s hard for what we’re all advocating to have a chance, and I think it’s going to mean that we’ve got to put a cap on carbon in order to start living with limits. If we do that, I’m quite optimistic as to what beautiful things will happen. Since none of the other species on earth are capable of putting a cap on carbon, that would make us the first because we are the only species who could do it. MARY BERRY: I want to say that for a while we had a pretty good diversified agricultural economy in Kentucky. Our marginal landscapes were well farmed because of a high dollar crop. When the program that protected that crop left, corn and soy beans took over. MARY BERRY: And dope. So farmers will farm well if it will pay them. Maybe. Wes, we don’t agree on this, I think. MARY BERRY: But the constituency, I maintain, is going to have to know something. WES JACKSON: And I’ve seen people in California and in a few other places who know something. WENDELL BERRY: I’ll just say that the instrument to stop the elimination of too many farmers that’s still going on is success. Instead of letting the farmers produce themselves into bankruptcy, we need to keep them going by maintaining a price that allows them to prosper. To do that, you’ve got to have production control and some form of price support. The old name for that in the Agricultural Adjustment Act was parity. MARY BERRY: And we need to talk about parity. WENDELL BERRY: Parity means a kind of equation between the economies of the farm households and the households of other people gainfully employed. It means an economic balance between country and city lives. That we do need to talk about. MARY BERRY: It’s time to have a fifteen-minute break. The questions are being collected, and when we come back, I will ask them. I’ll take the easiest way to answer that, and then I’ll pass on the harder part. I think sometimes people misunderstand me when I say homecoming. I know that some people can’t go to the place where they were born, and I understand that. I think what we’re talking about is to just go someplace and stay; as Wes says, dig in somewhere to make a home. Gary Snyder said that too: “Just stay. Get someplace and stay.” Some of us are lucky, and I consider myself very lucky to love the place I’m from, but that’s only part of what we’re talking about. It’s not the whole thing. WENDELL BERRY: Well, choosing a place is like choosing in any other relationship. Once the commitment is made, then I think you’re eligible for certain rewards. I don’t think that they’ll be the ones you foresee, I don’t think they’ll come on a schedule prescribed by you, but I do think that there will be rewards. Places have limits. Human relationships have limits. When you hit the limit, you think, “This is it, I’ll have to try for something else now.” But you keep on. And then, somehow, the situation opens up and you begin to see more than you saw before. I think that the collection of such experiences in a place is a reward in itself. But these are modest rewards, they’re not sensational things. So there’s an interesting question: Can you be content with modest rewards? If you can, you’ve already been rewarded. MARY BERRY: Let me also say a word about going home to a place where your family’s been for a long time: it’s not all great. Everybody knows you, knows how old you are, remembers what you did as a teenager; so sometimes, you know, if you go to, say, the next county, it could be a relief. Wes, would you like to talk about homecoming? WES JACKSON: I think about the experience for one hundred and fifty to two hundred thousand years with the big brain, and most of that was in some tribal relationship in which people were more or less forced to get along and get their sustenance and health needs taken care of. Our problem today is that, starting ten thousand years ago with agriculture, we became a species out of context, and we began to live in a civilization. Some of the behaviors we carried from our Paleolithic past remain requirements in our time; some of them out of that Paleolithic civilization are best served when we dampen them down. But the larger point is that we are land animals, and it doesn’t matter whether our religion comes out of Confucianism or Paganism or Christianity or whatever; ultimately there has to be a connection back to land and water and air and the resources that sustain us. So that’s basic within us. Most of that goes with the grain; most of what we are about as land animals goes with the grain from that past. But there’s a lot of what we’re doing that goes against the grain, which then creates perturbations we don’t know how to handle, especially when we get these constant infusions of fossil carbon that drive our technology. Because we have been technological creatures for a long time, we seem to take every opportunity to develop technology, with the result that what we now have is a species that has the worst kind of fundamentalism, worse than any religious fundamentalism, and it’s technological fundamentalism. That comes with the milk. This is why I keep returning to that cap on carbon because it will help us to see how good our technology can be. So for us to try within the mix, within this culture in which the temptations are all around us—whether it’s the cars or the airplanes or the iPad or the television or whatever—our inability to say no is what’s doing us in; therefore, if we get that cap, and then this is the hardest—I already alluded to it if I didn’t say it—we’ve got to talk about the necessity to end economic growth and figure out how to meet bonafide human needs. What I think we’re seeing now in some of the sustainable agriculture movement is an acknowledgment of the necessity to do that, but the deck is stacked against us and we can get there only if we’re like the Miao people in China or we’re like the Amish or we’re like other folks who are up against it. Ultimately we’ve got to embrace a movement, develop a constituency leading to political change that will insist on a cap on carbon. Otherwise we’re just going to keep thrashing around and having our isolated little virtues. Meanwhile the central part of this continent especially is going to continue to contribute to a dead zone, is going to continue to pile up the nitrogen and continue to have soil erosion. I don’t think we can say no unless we put the cap on carbon and recognize the necessity for restraint. MARY BERRY: You gave an answer to both questions, Wes. It’s amazing that you did that. WENDELL BERRY: I think what really screwed us up was oceanic navigation because it taught us to think that if we didn’t have what we wanted here, we could get it somewhere else, or if we didn’t like it here, we could go somewhere else. That has made us infantile in a way–a bunch of grown-up children. One of my good teachers once said, “People are never worth a damn as long as they’ve got two choices.” I think that’s profound. I’ve thought about it all my life, and what it means is that if you don’t any longer have a choice, you make the best you can of what you’ve got. And commitment, whatever we mean by that, is the removal of the extra choices. MARY BERRY: Here’s a question that asks about how, when, and why we change our minds. What, if anything, have you two shifted your opinion on in your lifetime and what led to that? So how do we change—how and when and why do we change our minds, first of all, and second, have you two changed your minds about anything in particular? WES JACKSON: Yeah, I have. WENDELL BERRY: Yeah, me too. WES JACKSON: All I can say is that I’ve changed my mind because I’ve been wrong. I finished my graduate work in genetics in 1966. I didn’t think then that we’d feed 7 billion people. And of course we’re not doing it; it’s fossil fuel that is doing it. A lot of my friends went off to help make that Green Revolution, most of them geneticist plant breeders. If somebody had told me then that we would double and triple the yields, I wouldn’t have believed it. I did not foresee the potential for a plant to greatly change its ability to take up nitrogen and give us those kinds of yields. I grew up in Kansas and went to Kansas Wesleyan University in Salina. The Strategic Air Command had its jets out there with nuclear weapons on them, and they’d take off every night and head for the North Pole. I was sure we were going to have nuclear war before this century. I’ve been wrong on both nuclear war and on food. I’ve probably been wrong on most of the major issues, and that’s a comfort. WENDELL BERRY: Well, I don’t have a catalog of the major issues, but it seems to me that when you do commit yourself, then you submit yourself to the necessity of having your mind changed by the circumstances that you’re committed to. I’m not very much on planning for the future because most of my plans have gone awry every day, and what you’re called upon to do is to respond; it seems to me that response is inherently mind changing. I’m trying to search my mind and come up with something honest-sounding about when I’ve been really wrong and then changed back to the right, but I’m coming up blank. I know I’ve made some fairly large mistakes; what most impresses me, though, is that without having sense enough to do it, I’ve also made some very wise choices. MARY BERRY: Tell what big John said about the informed decision. Is that off the subject? WES JACKSON: Go ahead, Wendell. WENDELL BERRY: When my father was about my age now, he and I were sitting on his front porch in the dark. We were friends by then, didn’t need to talk much and hadn’t talked for quite a while. Finally he said out of the dark, “I’ve had a wonderful life.” I didn’t say anything, and after a while he said, “And I’ve had nothing to do with it.” After a while longer I said, “Well, do you believe in the informed decision?” and after considering, he said “Naw!” My father was a very prompt, intelligent, decisive, quick-minded, quick-acting man, and that was a very moving moment for me because I saw that in spite of his great resolve, he knew that throughout his life—when he’d been right, anyway—he’d been living from his heart, not from some effort to master the future. MARY BERRY: Wes, this is for you. You made a statement that system thinking is another form of reductionism. Please elaborate. WES JACKSON: Let’s say you put species A and species B and species C and species D into a mix, and then you put that into a computer, and that computer will have some kind of algorithm that will give you some output. What comes into that computer cannot capture all the inherent efficiencies that are associated with those associations. That’s one example. Another is you have a traffic problem, and so you look at the number of people within a city, you look at where the workplaces are; then you build a highway, you build bridges, and you build a cement octopus to move the traffic. Invariably it has a growth-inducing impact creating consequences that systems theory fails to capture. Or you take those two molecules again, two gases I‘ve already mentioned, hydrogen and oxygen. Let’s say you’re going to put a thousand molecules of hydrogen and a thousand molecules of oxygen into the computer, but the computer cannot tell you whether or not wetness will result. That would be an emergent property. The systems program would expect some output. John Holland at the University of Michigan, now deceased, worked to see if, with the computer, he could get a signal of emergence out of any systems program, and he could not. It turns out that there is emergence at every level in the hierarchy. For instance, in 1951 American philosopher James K. Feibleman came up with the twelve laws of integrated levels. You go from atoms—you’re going up a hierarchy structure now—to molecules to cells to tissues to organs to organisms. And there are twelve general laws associated with that. As you go up that hierarchy of the sciences, there are emergent properties at every level in the hierarchy, and if you have no history of knowing about emergence, you cannot predict it. See what I mean? In fact, a fascinating part of all this is that people were asking, “What comes after organisms?” Some said species, some said population. The late J. Stan Rowe, former ecologist at the University of Saskatchewan said, “What did the others have in common?” He said, “Well, they have contiguous volume. Species don’t have contiguous volume. Populations don’t have contiguous volume. Ecosystems have contiguous volume.” And so ecosystems then came next after organisms. He gave us the volumetric criterion for thinghood. And it satisfied Feibleman’s laws of integrative levels. So the systems thinking is what we run society on, and yet the emergent properties always catch us by surprise. They always catch us by surprise. WENDELL BERRY: Which is a very good thing. WES JACKSON: Sometimes yes, sometimes no. We put on a conference called Toward An Ignorance-Based Worldview, a consequence of something Wendell put me up to. I don’t have a mind of my own when I’m around Wendell. I think I should talk about that conference just a little bit, because Wendell insists that we’re up against ignorance rather than knowledge, that knowledge is not adequate to run the world, that we’re billions of times more ignorant than knowledgeable. So Bill Vitek and I did put on the conference. Out of that conference came a volume called The Virtues of Ignorance, with essays by a variety of thinkers. Bill Vitek and I co-edited the volume, with Bill doing the heavy lifting. There are nineteen essays in there. Go buy it quick! WENDELL BERRY: Which is a very damn good thing. It keeps us humble. That’s why we have to have an ignorance-based way of thinking. See? WES JACKSON: See, there it is. There it is. The virtues of ignorance. MARY BERRY: On that note I want to thank my friend Wes, I want to thank my father, I want to thank you all. ALICE MAGGIO: I would like to thank our speakers once more. Thank you for making the long trip from Kentucky and Kansas. I also want to thank all of our sponsors again. If you’d like to dig in to more of what you’ve heard tonight, please investigate the work of The Berry Center and The Land Institute. I also encourage you to dig in right here in the Berkshires. Please go get some BerkShares and start using them. Become a member of the Community Land Trust in the Southern Berkshires. And if you like our Annual E. F. Schumacher Lectures, please go to www.centerfornewecomics.org, where you can read past lectures for free and where we have video and audio recordings of past lectures. Also, you can purchase beautifully edited pamphlets printed from the 35 years of our Lecture Series. Please keep the conversation as well as the work going. Thank you so much for coming.